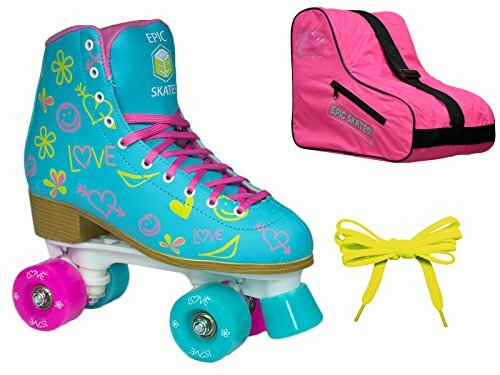 Make a splash the next time you're at the rink with the all new Epic Splash Quad Roller Skates. This new addition to the Epic Skates Fashion Series will stand out in a crowd thanks to the fashionable, vinyl uppers and color coordinated combination of 58mm indoor/outdoor quad skate wheels. They didn't forget the quality and reliability you've come to expect in an Epic Skate when putting this fashion forward design together. You'll get ABEC-5 Precision Speed Bearings, PU Cast high rebound wheels and cushions on top of an extremely comfortable high-top boot with soft, padded lining. Be sure to check out our other listing for Matching Adult Sizes!! If you have any questions about this product by Epic Skates, contact us by completing and submitting the form below. If you are looking for a specif part number, please include it with your message.